The Bullet Journal—the all-in-one calendar, to-do list, and diary—has become the DIY life organizer de rigueur. The YouTube video How to Bullet Journal has almost 10 million views. Stationary company Leuchtturm1917, which produces the go-to dot-grid journal, told Bloomberg its sales have doubled in the past year. 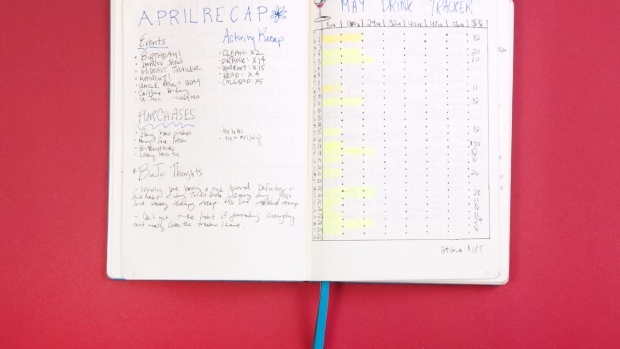 People swear by the Bullet Journal as the ultimate productivity tool. “It allows me to combine my calendar, lists, and seemingly endless notes in an organized fashion,” said Jenny Kaplan, a BuJo devotee who swears the journal has been a vital tool in starting her own business, Wonder Media Network. The journals are also pretty. But trying to get into the Bullet Journal fad can be intimidating. The hashtag #BuJo on Instagram surfaces over 2 million dreamy looking hand-drawn calendars and to-do lists—a mosaic of high-level artistry that, while awe-inspiring, will certainly intimidate anyone without an advanced degree in crafting. On top of the high aesthetic bar, the official method, created by Ryder Carroll, involves monthly spread-making sessions and a lot of jargon. Does that mean Bullet Journals are only for hyper-organized people with A-level doodling skills? This week on the new Bloomberg podcast, Works for Me, I—a regular person with bad handwriting, haphazard to-do lists, and zero artistic ability—talk about how I spent more than two months trying it out. On the show, I tackle every step of the Bullet Journal process, from making my first spread to learning about the wonderful world of habit trackers. You’ll hear about my surprisingly emotional ups and downs, including my disproportionate reaction to an olive oil spill. “It's complicated to explain; it’s not that complicated to do,” Rachel Wilkerson Miller, the author of Dot Journaling—A Practical Guide, told me. She’s right. Looking at YouTube tutorials and how-to guides only makes bullet journaling feel more inaccessible. The best way to get into it is to just buy a journal and start filling it. For those not yet indoctrinated, a Bullet Journal is an ordinary paper journal that has a dot-grid on its pages instead of lines, which makes it easy to draw neat looking calendars, to-do lists, and tables for keeping track of things, such as how often you do yoga or eat dairy. Users can customize their journals to include whatever might help them organize their lives. Traditionally, the BuJo combines to-do lists, calendars, and a diary. But devotees go wild on aesthetics, making their spreads look like dreamy-looking works of art. Beginners, Wilkerson Miller told me, should keep it simple. She suggested I make one month’s worth of spreads and draw everything in pencil before going over it in pen. She also told me to stick to one or two colors at first to avoid getting overwhelmed by crafts. I started out by making a monthly calendar, a basic daily habit tracker, daily to-do lists, a “wins” page to document my accomplishments, and a place to journal. Drawing my no-frills spreads for the month took about an hour and a half. It turns out, even I can use a ruler to concoct tidy looking calendars and tables. A little over a month into my experiment, I realized that my BuJo use was uneven. I loved having daily to-do lists—an admittedly amateur work-hack—but a useful one nonetheless. The physical monthly calendar, however, I didn’t really need, because I use Google Calendar regularly. I also found the habit tracker to be a useless exercise in data collection. Discovering how often I clean my apartment and call my dad in a given month was neither surprising nor life-changing. I didn’t end up doing anything with that data. So that’s what I did. The next month, I ditched the calendars and leveled-up my habit tracker to collect data that I might find useful. Feeling a little more confident in my crafting skills, I found a daily drink tracker on a Reddit thread, which would allow me to log my spending and consumption habits. In the spirit of bullet journaling, I even drew a little martini glass at the top of the page. I ended up liking and using the tracker; it taught me something new about myself. A little voice in the back of my head constantly worries about how much I’m spending and drinking. The tracker gave me data on the reality of the situation. Armed with that knowledge, I can feel a little bit less stressed about how much I spend on a recreational habit. One of the appeals of bullet journaling is aesthetic. It looks nice, which results in a sense of accomplishment. But using the journal won’t turn you into something you’re not. My journal is ugly, despite my sad attempts to make it colorful. Ugly journals aren’t any less useful. Writing things down helps us clear space in our head, which helps us do our jobs and live our lives.